Todolwen: Grateful For The Little Things .. I think it is great when little things in life can still make you happy and they don't have to be meaningful or important just something that gives your heart a little smile. I had one of those little smiles yesterday. Was it something earth moving? ... No, but it just made me that tiny bit happier and grateful as well. I had slipped on some black ice on our driveway in the morning but I was able to just catch myself just before falling. Boy ... was I happy that I didn't hit the frozen ground but I did tweak my back a little with the jerking movement I must have made to not fall. I am in some pain but not as much as I would have been if I had fallen, so that is already something good and I am grateful. My happy smile though came from something else yesterday. 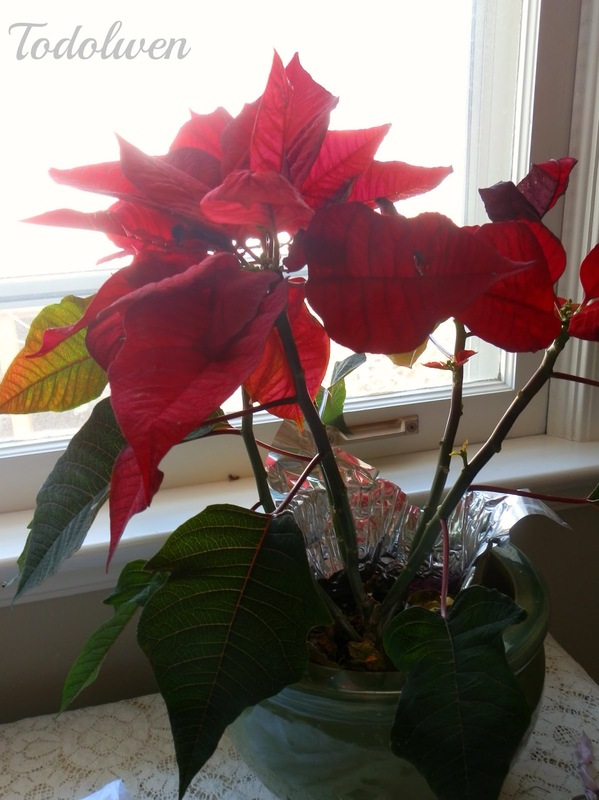 I had shared my beautiful poinsettia that I had received as a gift from one of my sweet neighbors a few months ago. Unfortunately I don't seem to have a 'green thumb' when it comes to these bright red blooming plants by the look of it because no matter what I did, it kept loosing it's red and green leaves as you can see in the photograph above. Yesterday though whilst watering it I noticed something that gave me my little smile. It was a new tiny little flower that was newly growing on one of the stems. This was a first for me with this type of plant and it made me that bit happier. These days I am so grateful for the fact that little things like this can still make me smile because this way I can enjoy life so much more. I wish you all many little things in life that will give you that smile in your heart. Ouch, I hope you back gets better really quickly, back pain is no joke. And what a lovely surprise to see your plant producing new life. I can never keep Poinsettias going, they always die on me. Yes Karen! It does not need so much to make us a little bit happier. To be healthy is the only important thing and the little joys are "the cream on the cake" :-). My friend and I were walking on a sidewalk, and all of the sudden, one of us hit an icy patch. We both fell right on our backs. It was so funny, and I was laughing like a crazy woman. I couldn't even get up right away. Someone walked by. They didn't offer to help or ask if we were okay. They just looked at us strangely. Oh, well. It's a good thing we weren't really hurt. I have no idea if I was the one who brought my friend down with me or if she was. Luckily, it was funny, and no one was hurt. Congratulations on the keeping the Poinsettia alive this long. I don't know much about them and void buying/killing them. It's nice to know that this one grew a little sprout for you! So sorry you twinged your back - done that, been there and it hurts no matter what. I have absolutely no luck with poinsettias and generally end up tossing them out right after Christmas. Since we moved into this apartment I struggle to keep anything alive. I used to be able to grow all sorts of African Violets but they flatly refuse to grow here - I think the light must be all wrong. Girlie ... please be more careful treading on the ice. You were very fortunate. A little "ouch" is a lot better than what could have happened. 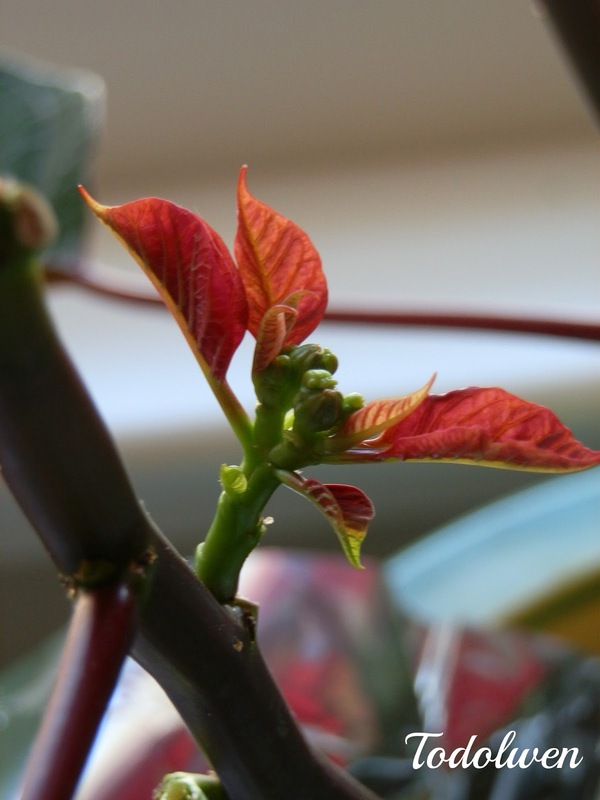 I, too, noticed a new bud on my pathetic poinsettia plant, too. Hoping for miracles!